Western Australia’s Kimberley is an area of spectacular natural beauty, with landscapes and wildlife like nowhere else on earth. It is home to a living Aboriginal culture tens of thousands of years old. Pressure to open the Kimberley coast up to mining, alongside the impacts of destructive wildfire, noxious weeds and feral animals threaten to tip the balance on the Kimberley. By acting now – we can secure long-term protection and management, so that the Kimberley remains one of the world’s greatest and most pristine natural places. Ask your local MP to support calls not to take water from the Fitzroy River or its floodplains & for a ‘no dams’ policy that would pass the pub test! I write to express my support for protection of the Fitzroy River and its National Heritage Listed floodplains from water extraction. This summer we have seen the devastating impacts of taking water from the Darling River. Millions of fish have died while cotton crops are kept green. This is the fate we need to avoid for the mighty Fitzroy River. We need to ensure that the lessons of the Murray Darling are heeded. Complex water allocation rules and regulations cannot protect the health of a river. There needs to also be real protection for the river and floodplains. It is not enough just to ban dams on the river and major tributaries. Taking water from the river and floodplains for storage in ‘sneaky’ dams near to the river also destroys river flows and floodplain health. In March at a Ministerial Fitzroy Forum in Fitzroy Crossing, the Martuwarra Fitzroy River Council of Traditional Owners called for a buffer zone against irrigation, dams and mining to protect the river. Their proposed buffer zone covers just 9% of the Fitzroy River catchment but protects 90% of the National Heritage Listed floodplains. I am very encouraged to learn that Water Minister Dave Kelly has said this buffer zone would be considered as part of the upcoming consultations on the future of the river. However, the option of taking massive amounts of water for large scale irrigation is also still under consideration. A buffer zone has previously been supported by Traditional Owners in the Fitzroy River Declaration, and over 100 leading scientists and researchers in the Fitzroy River Science Statement. Options for sustainable development exist without taking life-giving floodwaters for irrigation. There are a range of options such as recreational fishing, tourism, bush foods harvest, science and conservation, arts, carbon, education, culture, and traditional pastoralism. Outside of the river buffer zone some opportunities for smaller scale mosaic irrigation from groundwater may also be possible. The Fitzroy is one of our last great intact river systems, it is National Heritage Listed for its outstanding cultural values. 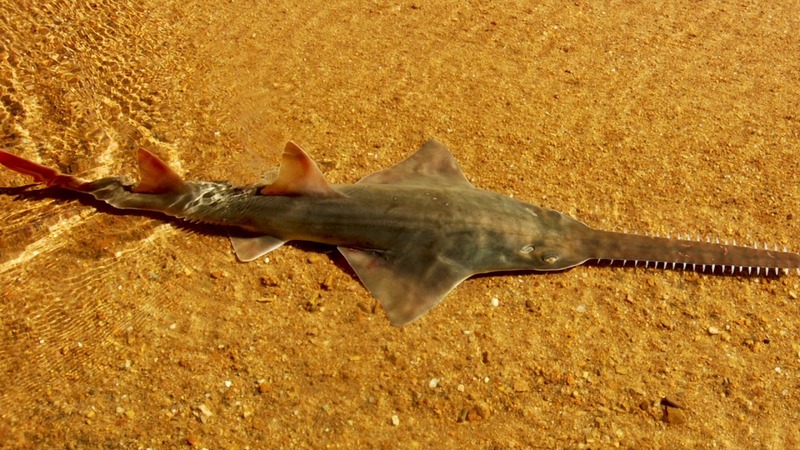 It is the world’s last stronghold for critically endangered sawfish. As my local MP, I urge you to please support a buffer zone for the Fitzroy River. I ask that you support my calls not to take water from the Fitzroy River and its National Heritage listed floodplains. This is the only solution that will avoid the fate of the Darling River. If you choose no, you will not receive ANY emails from Kimberley - Like Nowhere Else even if you were on our list previously. Remember you can also unsubscribe at any time. The McGowan Government has agreed to consider protecting the Fitzroy River's surface waters and floodplains.